We like to change things up at our house. It keeps things looking fresh and interesting. Sometimes we will rearrange the furniture or even paint a room. It livens things up a bit. 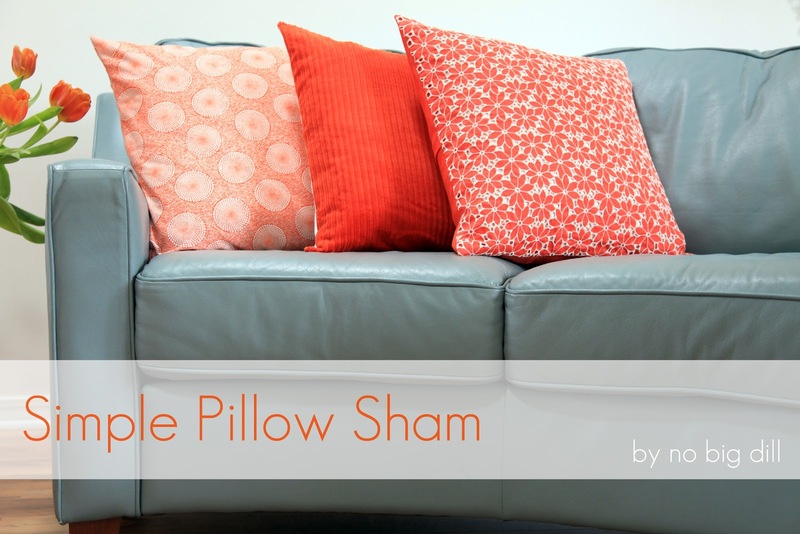 One of the absolute easiest and most inexpensive ways to change up a room is to add or replace some decorative pillows. It uses just a small amount of fabric and it requires minimal sewing skills--stitching a few straight lines and some buttonholes is it! I like to stick to a specific color pallet but use different textures and patterns when I choose fabric. Most of this fabric I've used in previous projects leaving me with small amounts left over, just right for a few shams. If you only have enough for the front of the pillow, don't worry, just use a solid cotton on the back. To figure out how much fabric you'll need measure your pillow. Add an inch on each side for the front piece. For the back pieces, add an inch for the width and add 4 1/2 inches for the height to your measurements. For a pillow that is 20" square you will need a little less than a yard of fabric. You will also need just a scrap of fusible interfacing as wide as your pillow sham and 2 inches high, cut in 2 strips. The interfacing will just provide a bit of structure for the placket on the back. Begin by ironing a piece of interfacing to the wrong side of one of the back pieces 1/4" down from the long side of the rectangle. Next fold and press that 1/4" down over the interfacing. Finally, fold that edge 1" (the interfacing will now be completely covered) and press in place. Repeat for both back pieces. Stitch the folded edges along the inner folded edge on both back pieces. Using pins or a fabric marker mark your 3 buttonholes. The holes will be parallel to the folded edge. Center the first one and then measure out 5"s on either side. How big do you make your buttonholes? Measure the diameter and the thickness of your button, add those together and that's the size of buttonhole. Now all three pieces are ready to be sewn together. With right sides together, overlap the two back pieces with the buttonholes underneath by 1". If your back pieces are slightly larger than the front square just trim them down to size (I gave you an extra 1/4" for each piece). Pin and stitch 1/2" seam around the entire perimeter of the pillow. Trim each corner and finish seams using a serger, pinking sheers or a zig-zag stitch along the perimeter of the sham. Turn the sham right side out and sew on buttons. Voila! It spruces up the room instantly with little money spent. You'll want to change them every week. I love those sharp corals against the slatey blue. Thanks for such a clear tutorial! Love it! I have scraps and love pillows. A-ha!! So that's how it's done. Everyone keeps saying it's easy peasy, but now you've proven it with this tutorial. Great....much to do, but I must make some pillows now! Perfect timing! I was just shopping for pillow sham fabric and hoping I could figure out how to make them as I went. You just made my life so much easier. Finally -- a sewing project I MIGHT be able to manage. :) And, oh, how I love pillows! Dad--um, I need to teach you how to sew. I'm loving them! I never really gave a thought to orange, but whenever I see it paired with white I just think it looks so summery and fresh! Yay! Love your colors, and you made me feel like I might be able to do pillows! Love this tutorial! Thanks for the great info! Ooooh! I made some once (long ago) when I barely knew how to sew and chose fabric that was impossible to deal with. This makes it look so easy that I just might try to make some new ones... Especially like the coordinating but not matching pillow look. Thanks for the tutorial! That's a great tutorial! I have a couple of spaces I'd love to spruce up! Thanks! I hope Drummer will be sleeping through the night for you soon!